WASHINGTON — Evangelical Christians from the United States and other areas of the world are helping "destroy" the historic Antioch Church in Syria by offering poor, vulnerable orthodox Christians aid and assistance if they "convert" and start worshiping at evangelical house churches, a prominent Syrian priest asserted. Archimandrite Alexi Chehadeh, director-general of the Greek Orthodox Church of Antioch’s Department of Ecumenical Relations and Development, traveled from the church’s headquarters in Damascus, Syria, to the U.S. capital last week to take part in the first-ever World Summit in Defense of Persecuted Christians hosted by the Billy Graham Evangelistic Association at the Mayflower Hotel. 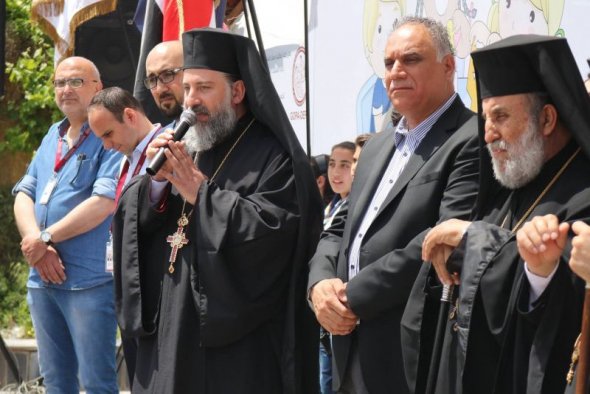 Chehadeh sat down with The Christian Post to discuss the situation in Syria and the impact that Christians in the West are having when it comes to aiding the civil war-ridden country’s minority Christian population. “For us personally, I didn’t see any help from the American church directly. Perhaps, [aid went] to our brothers and sisters in the Protestant Church or Baptist Church or other church denominations we have there. But for us, we didn’t receive any help from the Church in [America],” Chehadeh explained. Chehadeh was asked to clarify if it is Christians from the United States and all over the world who are trying to use money, aid and assistance to pressure Orthodox Christians to join evangelical churches. He explained that many of the efforts to get Orthodox Christians to “convert” are being supported materially by evangelical groups in the U.S. and other places. However, he said the effort is largely being carried out by pastors from Lebanon or Syria. “For instance, [they will say], ‘Come to my church then you will receive help,'” he continued. Chehadeh was also asked if what the evangelicals are doing in Syria is really helping “destroy” the Antiochian Church. “If I am persecuted from somebody outside of the Christian family, I can understand. But I can’t understand that another Christian would persecute me in another way,” he asserted. Chehadeh explained that he told attendees of the summit on Thursday that if it were not for the Antioch Church, the many other Christian denominations existing today likely wouldn’t be here. “Today, I spoke to the people and I said, ‘Everyone has his or her own church congregation by the Church of Antioch.’ Do you know why? Because the Church of Antioch was the first church in the whole world established by the gentiles — Acts 11: 20-21,” he said.